The question had been plaguing us for almost the entire time we'd been working on the van. There was no doubt she needed to be spruced up and looking her best, but after the weeks of repairs and sanding, tending to her every scratch, ding and smudge, it seemed such a shame to cover up all those years of wear and tear with a shiny new coat, in doing so wiping a part of The Canavan's history, forever. Plus we'd seen a few painted vans around the traps, and to be honest, there's something quite charming about a vintage vehicle that's still in its original condition. 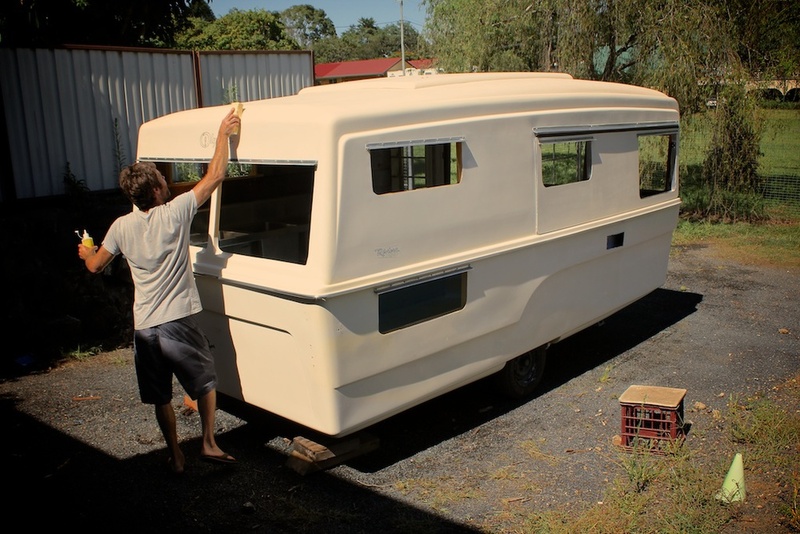 The week before Christmas, with a stinking hot heat wave and dusty afternoon winds and storms forecasted, the van was finally ready for the final touch - 5 coats of Poli-Glow - an american product used in the marine industry that leaves a glossy, UV resistant polymer coat. A 6am start on a tipped-to-be 40 degree day, and with a handful of You Tube tutorials as our reference, we armed ourselves with sponges and took the plunge. Five hours and five coats later, we had a shiny, 'good as new' van on our hands. Even the neighbours were popping their heads over the fence, pre-Christmas drinks in hand, in admiration.